100 Quilts for Kids wrapped up last week, and now that I’ve had a moment to breathe, it’s time to share! I managed to finish 5 quilts to contribute, and I’m SO happy with all of them. For my first quilt, I went with a simple strip pattern. 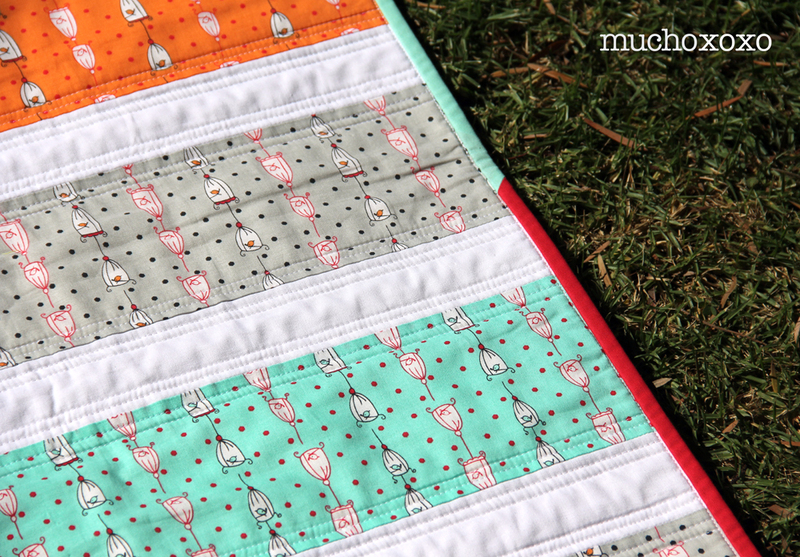 I love how it shows off this adorable fabric (Folk Tale Bird Cages by Natalie Lymer). The colors are so bright and refreshing, and the sweet little birds just make me smile! I did double rows of stitching instead of just one, and I love it! I especially love the little something extra it gives to the solid coral back. 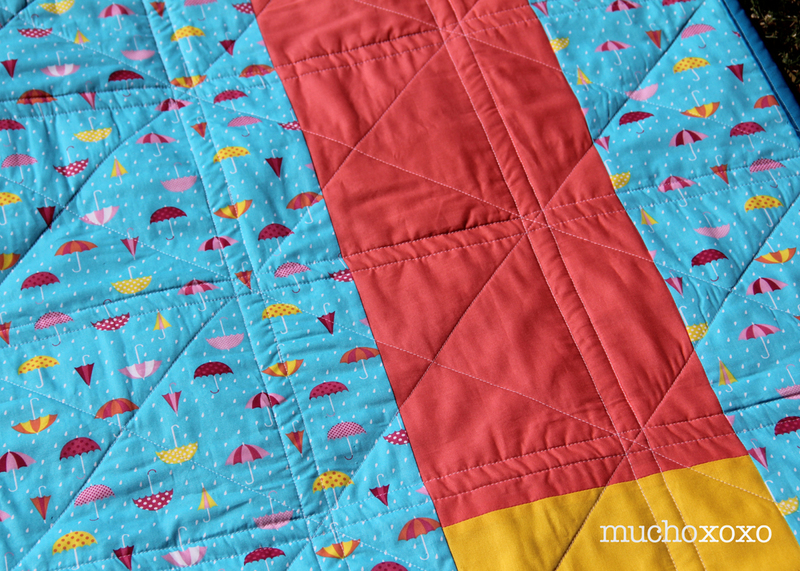 This is a great pattern for beginning quilters, or anyone looking for a quick and fun weekend project. It’s also perfect for showcasing prints that you just can’t bring yourself to cut up too much. The finished size is about 42″ x 42″. 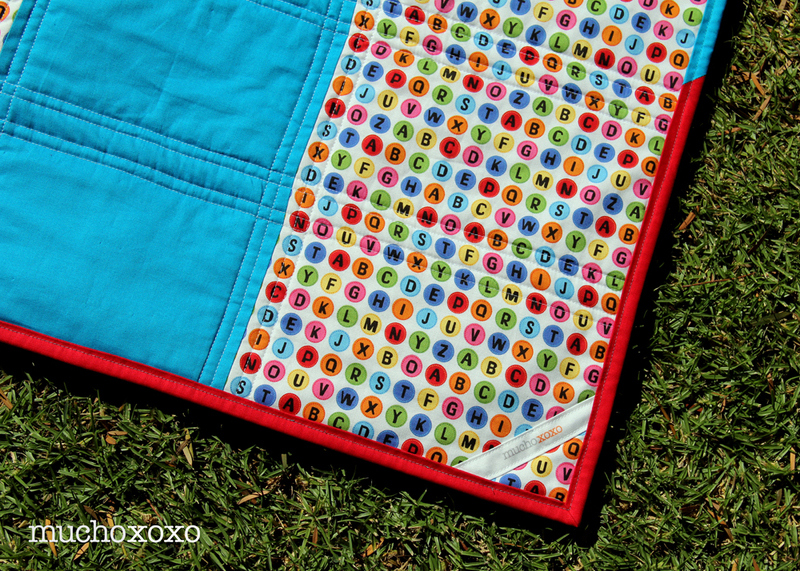 This quilt is going to Project Linus. 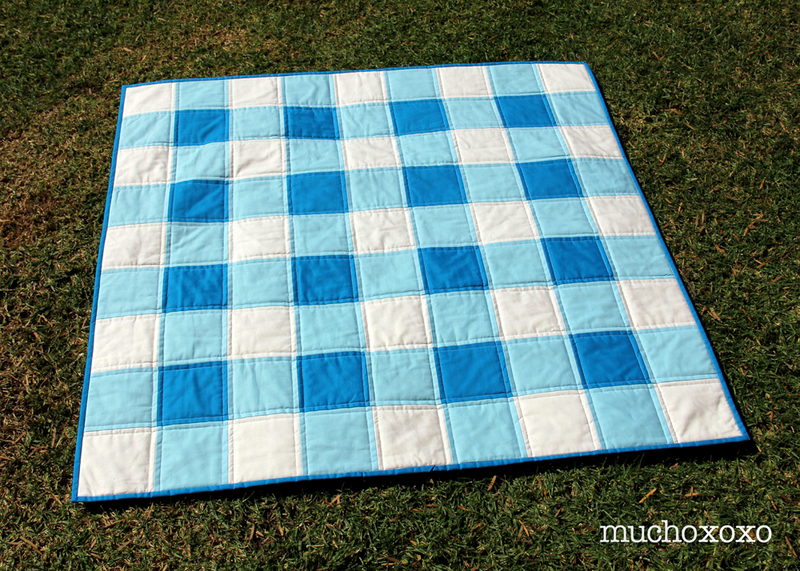 My next contribution is this fun gingham check quilt. I’ve been wanting to make one of these for a while. 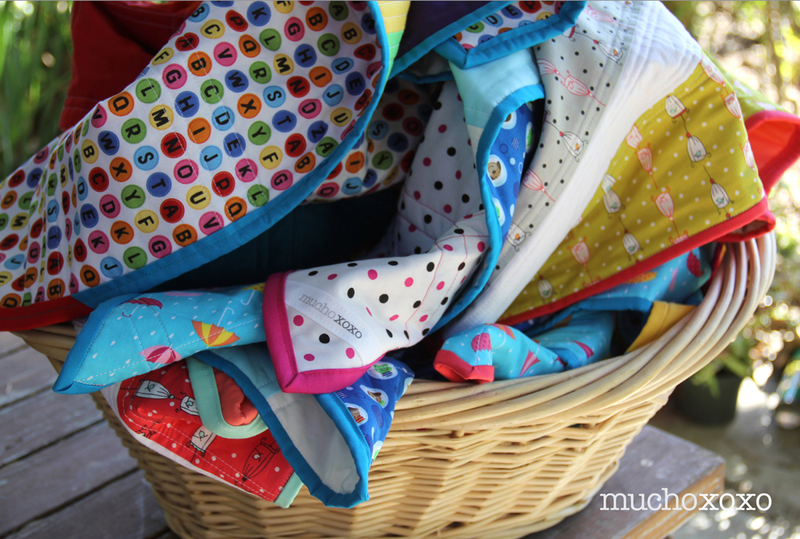 I have a pretty big stash of solids, so this was a great way to bust through some of them! I used Kona solids in White, Robin Egg and Lagoon for the front and binding. I knew I wanted to offset the solid front with a printed back, but I didn’t really have anything in my stash that felt right. Luckily, I found a cute print at Jo-Ann Fabric during a crazy clearance-on-top-of-clearance sale. Who doesn’t love monkeys, dogs and frogs! I did a single row of stitching on both sides of each seam. Clean and simple. The finished size is about 40” x 40”. This quilt is going to My Stuff Bags. 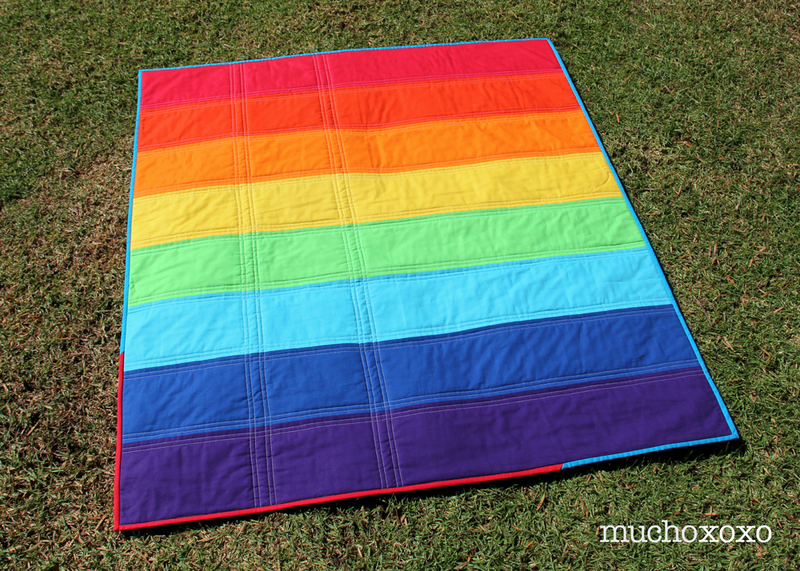 I couldn’t resist sewing up a fun rainbow stripe quilt. 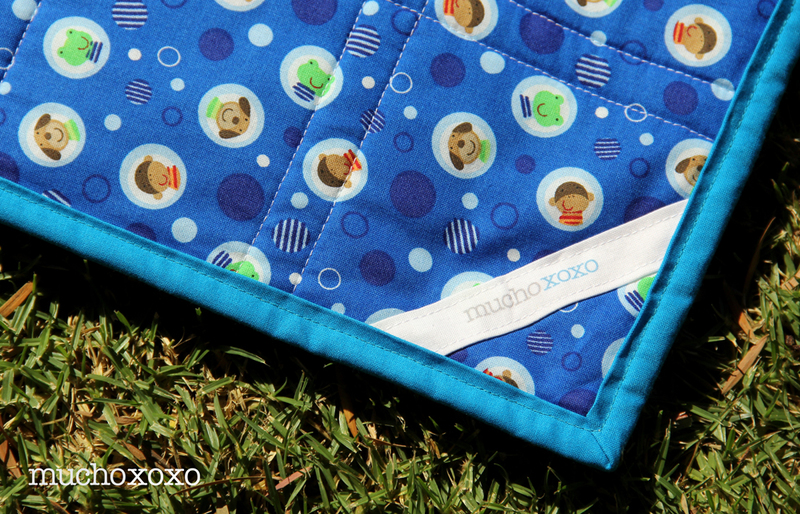 The front is all Kona solids from my stash, and I picked up a playful alphabet fabric for the backing. It wasn’t quite wide enough so I added a bright strip of blue. I’m a big fan of breaking up backs this way. It’s easy and adds a nice graphic punch to it. I used the blue, as well as a little pop of red, for the binding. I did double rows of stitching along each seam, as well as along the blue strip on the back. The finished size is about 43” x 47”. 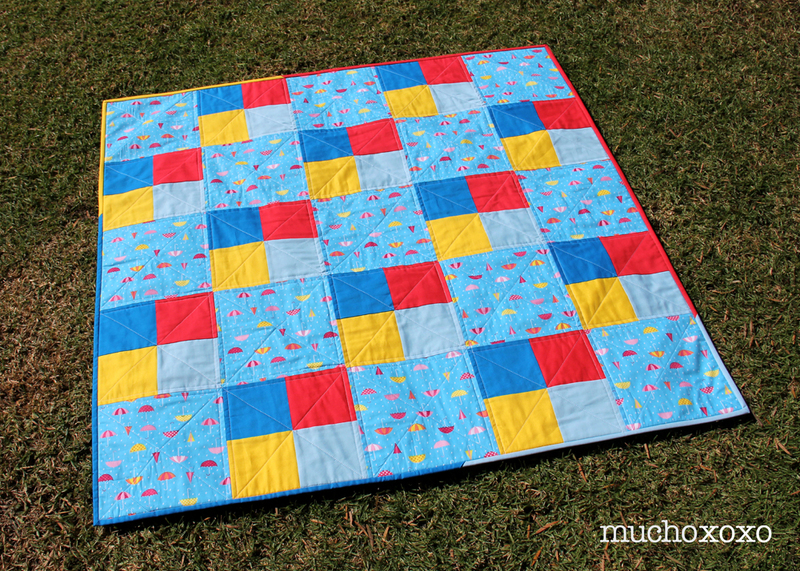 This quilt is headed to a local NICU. 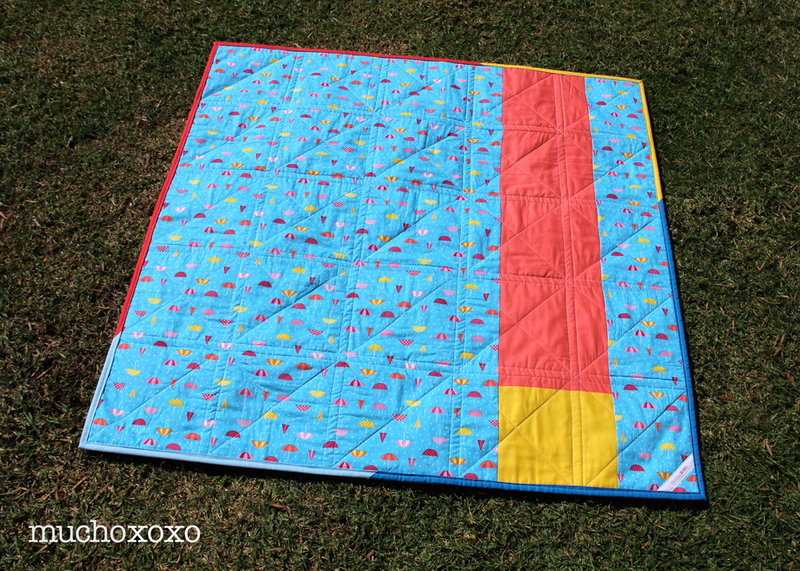 My next contribution is this cheerful color block pattern featuring a fun print and bold solids. I picked up this print for about $2 a yard (woo! ), and originally was thinking I would just use it as a backing fabric. But the more I looked at it, the more I wanted to incorporate it into the front. Maybe it’s because I’ve been desperately hoping for rain (Los Angeles has been hot hot hot), or maybe it’s because it’s just so adorable! I used this quilt pattern for a baby quilt I’m working on, and I love it! It’s fun and versatile, and works equally well with prints and solids. I did straight stitching as well as diagonal. I love the combination of the two. And of course, I had to do scrappy binding. The finished size is about 42.5” x 42.5”. This quilt is going to My Stuff Bags. 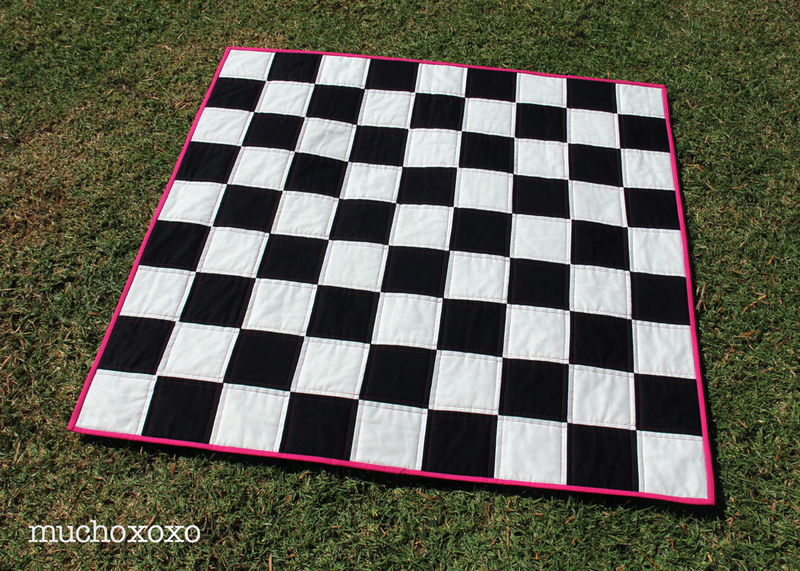 My final quilt for 100 Quilts for Kids is this fun checkerboard. Simple and graphic, with a pop of hot pink. 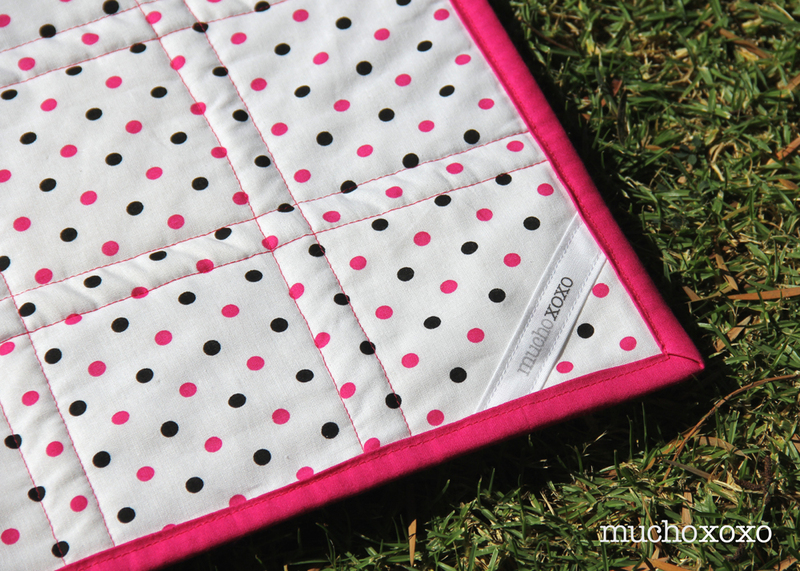 I used a fun polka dot fabric for the backing, and a coordinating pink for the binding. 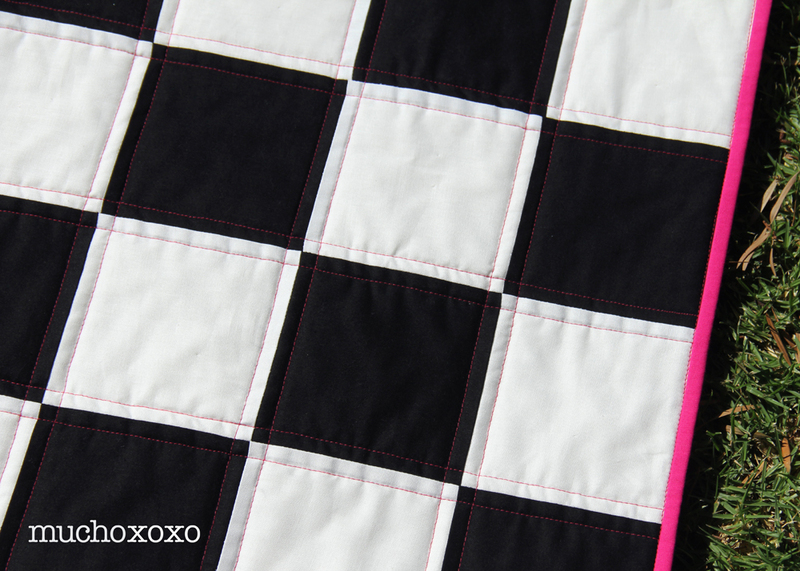 I also decided to quilt with hot pink thread just to add a little extra pop. The finished size is about 40” x 40”. 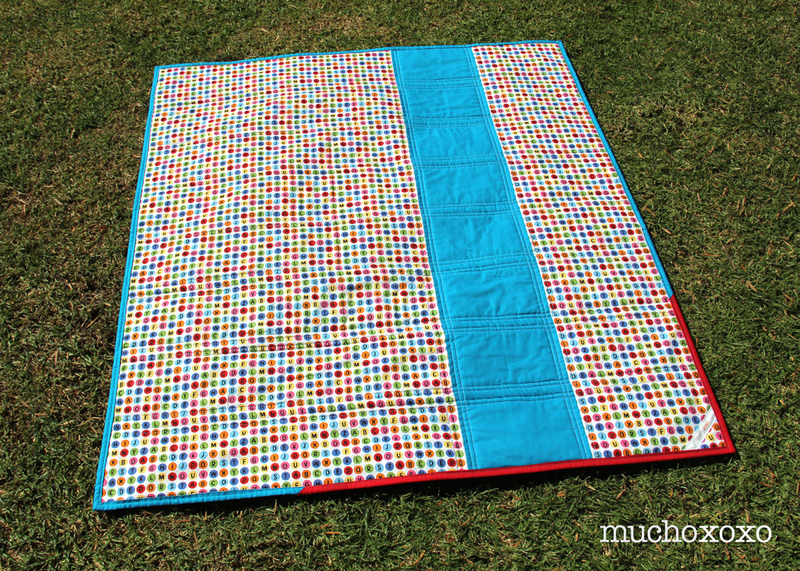 This quilt is going to Project Linus. If you haven’t already, I’d encourage you to hop on over to Quilts in the Queue and take a look at what everyone else made. There are some fantastic contributions, and I’m sure they will bring smiles and comfort to some very deserving children. 100 quilts for kids: progress! The deadline for 100 Quilts for Kids is right around the corner, so I thought I’d share a quick peek of where I’m at! What the huh??? OK, I might be having a little too much fun. Or, I’ve gone completely insane. 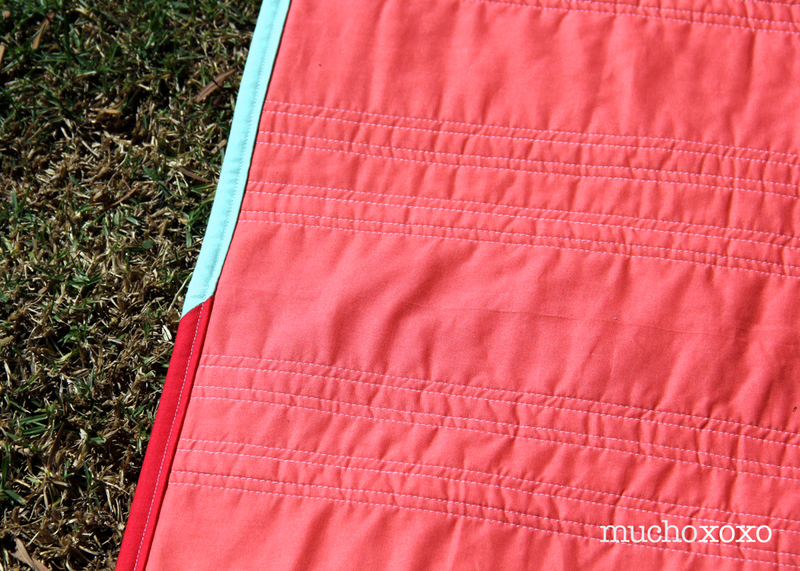 Possibly some wonderful combination of the two… I originally planned on making one, maybe two quilts. But as you can see, those numbers have grown. I couldn’t help myself! To recap, 100 Quilts for Kids is an annual charity quilt drive that encourages quilters to make and donate a quilt to a child in need. This year it’s being hosted by Quilts in the Queue and it runs from August 1st – September 30th (only a few days away, don’t remind me!). I’ve been wanting to make some quilts for charity for quite a while, so this was the perfect opportunity. 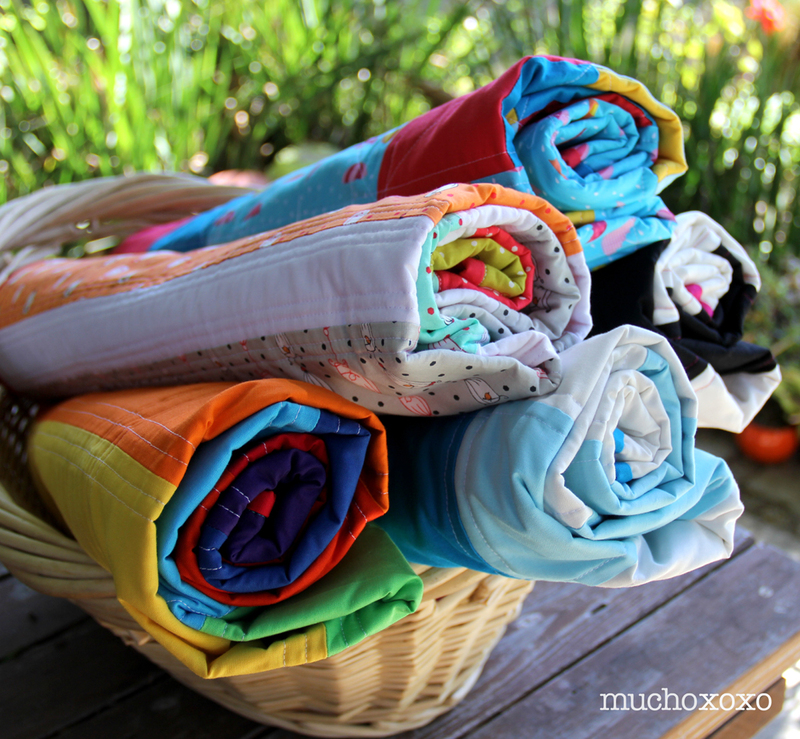 use as much fabric from my stash as possible. pick prints/colors and quilt patterns that just make me happy. finish one quilt before moving on to another. (obviously, I failed miserably at this one). Anyway, time to get back to it. Wish me luck! Stay tuned for pics of the finished quilts and info on the charities they’re going to. 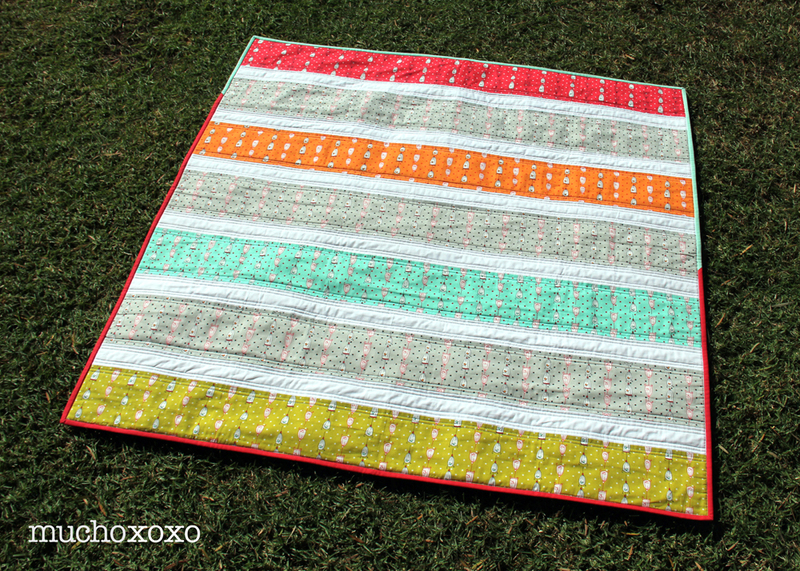 And hey, if you’re a fast quilter, there are still a few days to get in on the fun! Info and guidelines can be found here. 100 Quilts for Kids is an annual charity quilt drive that encourages quilters to make and donate a quilt to a child in need. This year it’s being hosted by Quilts in the Queue and it runs from August 1st – September 30th. There’s still plenty of time to get involved in this quilt-a-long for a great cause. Last year nearly 200 quilts were donated, and they’re hoping to surpass that this year. 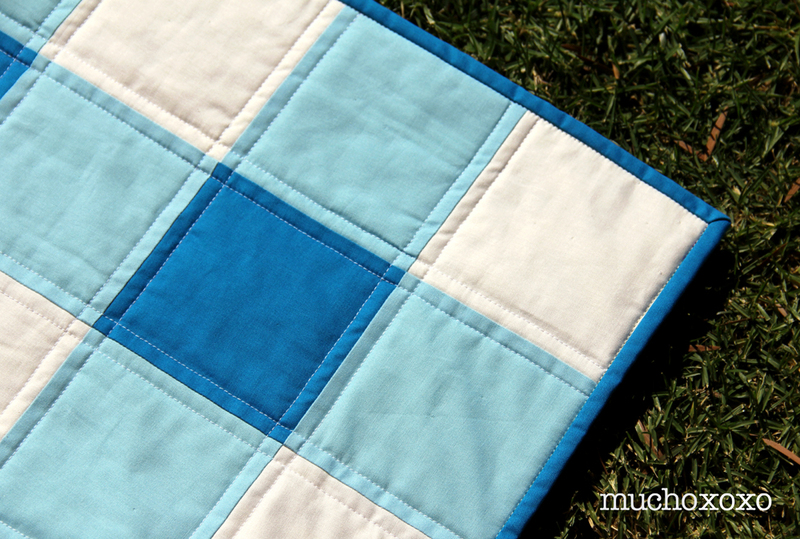 If you’ve ever thought about making a quilt for charity, here’s your chance! All the info you need to get started can be found here.